Xtreme Diesel Performance is the premier B2B and B2C retailer and distributor of quality products that complement Dodge, GM, & Ford diesel pickup trucks. 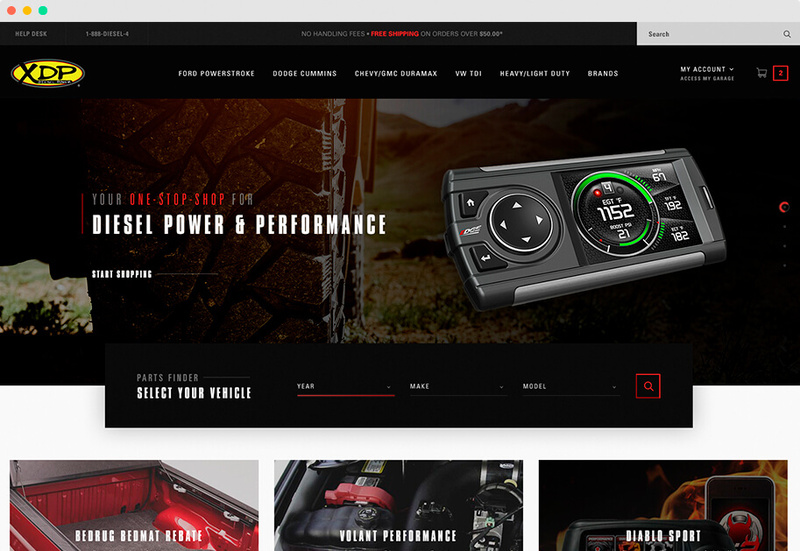 Xtreme Diesel Performance's previous online store was OK, but it wasn't the showpiece the company wanted. A high profile sponsor of truck competitions, XDP wanted an innovative and compelling site that would help them grow their business – particularly with B2B customers. For this they knew they needed a technology partner who would help them roll out new features and functionality – freeing them up to focus on their business. They were stagnating on their antiquated platform, and anything they wanted to add, they had to build themselves. They were tired of trying to reinvent the wheel – and they didn't want to lag behind competitor sites. XDP customers came to the site looking for auto parts that vary by Year, Make, and Engine. But with some 16,500 SKUs, finding what they were looking for wasn't easy. On XDP's previous ecommerce platform, a search for an air intake system would take you to 82 items – with no option for filtering on manufacturer. Frustration often led to customers exiting the site without buying. In a competitive industry, a key business objective was to build customer loyalty and increase return business. Repeat customers can park their personalized vehicle info in My Garage to rev up future transactions. Like a high performance car, XDP's new site on the Miva platform is gorgeous to look at and powerful under the hood. Fast, stylish, and distinctive, Xtremediesel.com extends the car theme to various sections of the site. From the home page, a Parts Finder tool quickly narrows down Year, Make, and Engine. From there, customers can browse through categories such as Engine & Performance, Drive Train & Chassis, Exterior, Interior, and Wheels and Tires that are specific to vehicle they own or repair. The 3D Product Visualizer lets customers click on a section of the vehicle to visually navigate to specific categories. It's a particularly good option for customers who aren't sure where to start. Now they can browse by one of five major categories, entering truck details, and scrolling through categories. The Build Gallery take advantage of User Generated Content, allowing customers to post photos of their customized trucks on the website. In addition to giving them bragging rights on social media – both theirs and XDP's – it gives car dealers visibility on a site with heavy traffic through XDP's event sponsorships. The Build Gallery also lets potential customers see the specific parts XDP offers so they can recreate the custom design on their vehicles. Built on the Miva platform, the new site is fun and fast for its gearhead customers, while also easy for XDP to manage. Wholesale customers have an extremely personalized experience with account-specific access to available products, pricing and warehouse availability. One of the key business advantages of this approach: XDP is able to streamline the ordering process for its expanding network of nationwide dealers. Miva integrated advanced search functionality provided by SearchSpring onto the site. With SearchSpring, XDP can provide product recommendations as the user types in the search field and promote specific items higher in results. It can also account for common misspellings or common word names to make it easier to find parts. XDP is particularly happy that more customers are taking advantage of core charge discounts. With this program, customers send back an item where a component can be reused and receive a sizable credit. With Miva, the discount is clearly shown on the product page – along with a link that asks the customer to acknowledge they agree to the terms. The program keeps XDP's prices competitive, saves money for customer, and lessens the impact on the environment. It's a win-win for all. With a reimagined, feature-rich website, customers are now able to discover products more swiftly, increasing conversion rates 24% over the previous year. It's now easier than ever for XDP to market and merchandise products, while streamlining business and shipping rules on the back-end. In an industry where both looks and performance count, XDP's partnership with Miva provides them with a technology platform ready for higher growth and even more site enhancements.